Tomorrow marks eleven months since our precious Biscuit passed away. This time of year, with summer quickly approaching, makes me remember the days that Biscuit loved to sun himself! 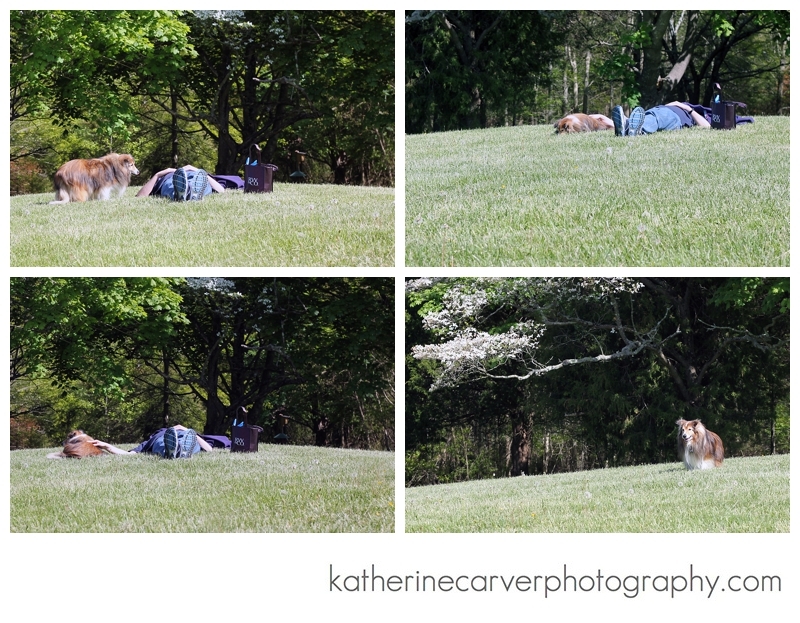 He loved to sit out in the grass with Doug and bask the sun, pictured below. Biscuit also sometimes liked to roll around on his back in the grass while enjoying the sun! I will never forget these ordinary, while simultaneously extraordinary, moments that we shared with our Biscuit. There are days that I wish we could have one more afternoon together to just sit together in the sun, one of Biscuit’s favorite pastimes. This is why it is so important to savor each day and be present in each moment and carve out time just to be. Biscuit gave us so much joy and he gave us so many gifts, including Victory. We still miss Biscuit very much, and even though he is not here with us in the physical form, Biscuit is always with us. Today marks ten months since our precious Biscuit passed away. May was a very special month last year because we took Biscuit on our last trip together (although, at the time, we did not know it was going to be our last trip together) to Vermont to visit the Orvis Flagship store where he was the Orvis Cover Dog Winner and represented the Orvis Petfinder Commitment, supporting dog rescue. We had a wonderful time together on this trip, and we are so happy and grateful that we were able to Vermont together before Biscuit got too sick to travel. 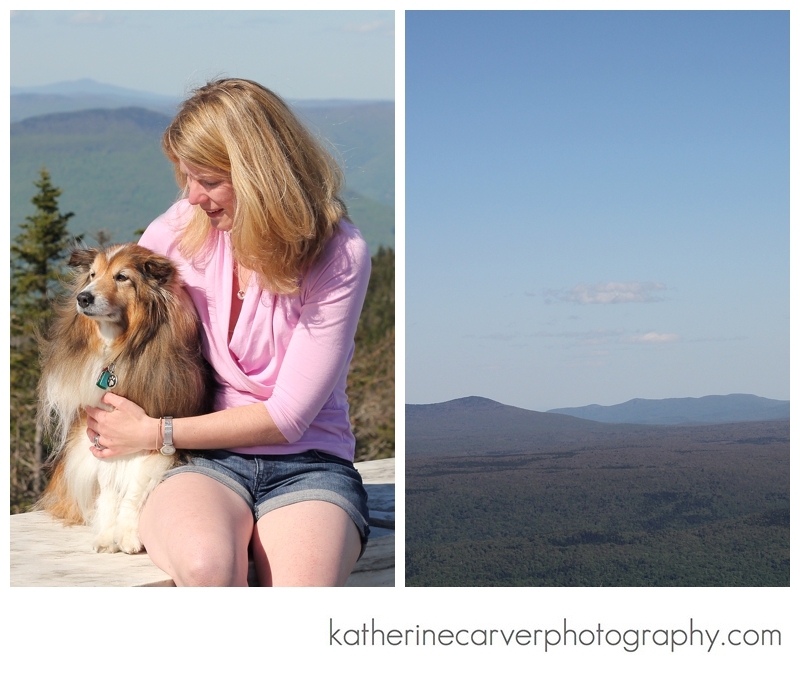 I remember how happy Biscuit was going to Orvis, King Arthur Flour, the Vermont County Store, going atop Mount Equinox together, and going shopping together in downtown Manchester (Biscuit went in all the stores with us)! Biscuit was so happy and so were we! 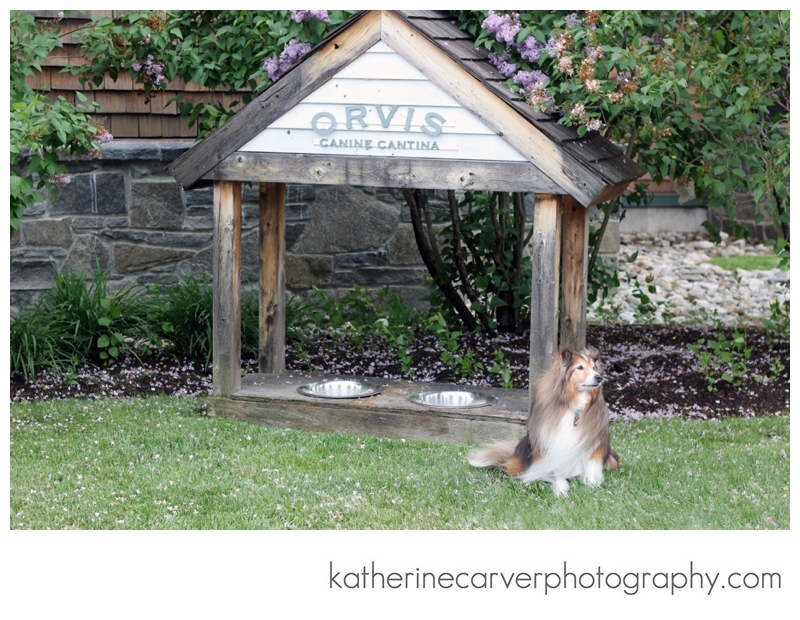 It rained during our trip, but we extended our trip and we therefore had a few days of gorgeous weather, and we were able to have a few dinners at restaurants, sitting on outdoor patios together, as Manchester is very dog friendly! On the rainy evenings, we ordered food from restaurants to bring back to the hotel so that we could eat with Biscuit and so that he would not be left alone. I also remember on this trip each night in the hotel, Biscuit wanted to sleep with us in the bed, which was not like Biscuit who typically always slept on his bed on the floor on my side of the bed. Maybe Biscuit knew that was going to be his last trip together. Biscuit came so far, and he made great strides, in a short amount of time. He was so handsome and he was full of life. We are truly grateful for our precious little Biscuit who changed and enriched our lives forever. You can view photos from our trip to Vermont here, here, and here. Today marks nine months since our precious Biscuit passed away. It feels like I have not seen him in forever, and it feels much longer than nine months since Biscuit passed away. One of the things that I loved about Biscuit was that he was literally my shadow and he was extremely loyal. He followed me everywhere, including the bathroom! While I showered or took a bath, he poked his head inside and, often times, sat right outside the bathroom waiting for me to go for his morning walk. Biscuit always sat contentedly next to me while I worked at the computer for hours. I tried not to get up too much in order to not disrupt his sleep as slept next to me on his Orvis bed. No matter where I went, he followed. Biscuit was always right there. I miss him being right there beside me. Biscuit just loved being with us; and we loved being with him. It was rare that we left him at home as we tried to include him in almost every facet of our lives. Biscuit gave us so much love. I never understood the human-animal relationship until I met our precious Biscuit. He opened our heart and eyes to so many experiences that we would not have experienced otherwise. He will always be our first fur baby. Sometimes, I can close my eyes and see him so vividly. 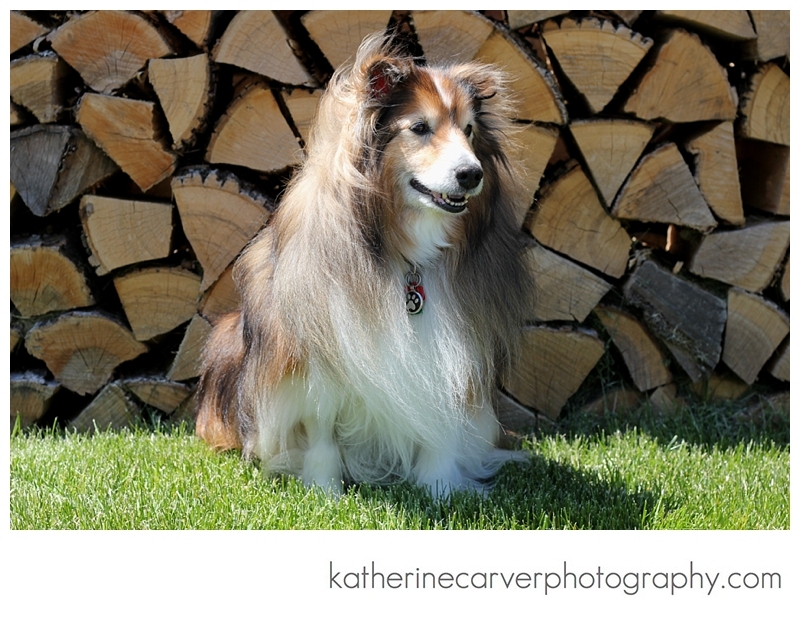 In the final months, I tried my best to imprint images in my mind so I could try to remember the little, quiet moments: the way he felt sitting on my lap in the car; the way his sheltie furs looked while blowing in the wind while on a walk; the way he smelled when I gave him a hug and kiss; the way he astutely looked at us when he persistently gave us the paw requesting a treat; the excitement in his clear brown eyes when we took him in his Hound About; and the way he looked while he slept so peacefully beside me on his Orvis bed. I am thankful for Biscuit. I am grateful for the myriad of photo albums preserving our memories forever. Every time I see an orange sky or a rainbow, I think of our precious Biscuit. Today marks eight months since our precious Biscuit passed away. One thing that Biscuit loved to do was take a spin in his Hound About! Soon after we rescued Biscuit, we knew that he had issues with his legs — they were extremely fragile and he suffered from arthritis. 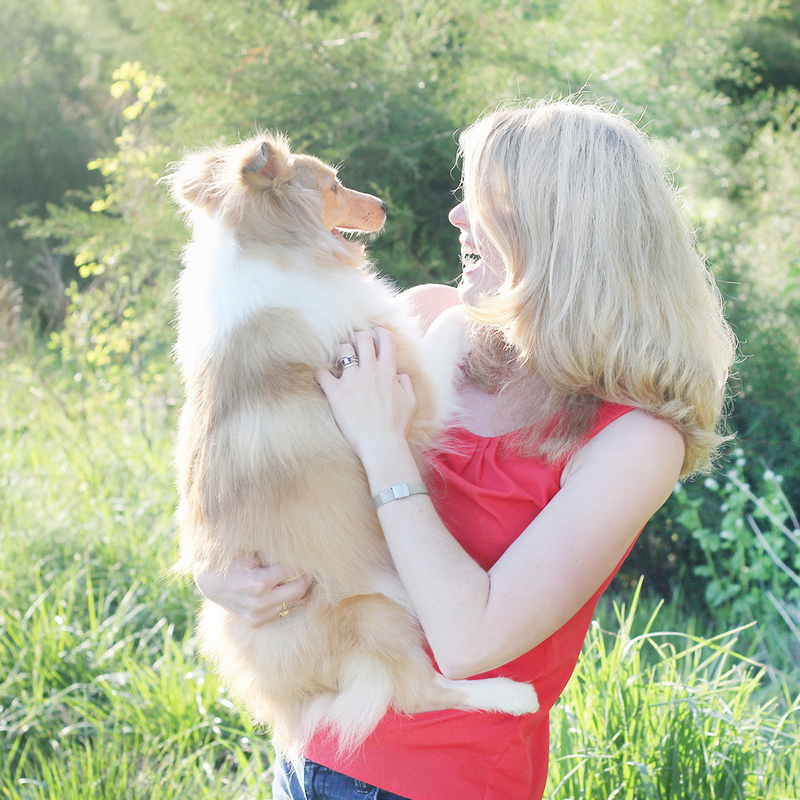 It was suspected per the Sheltie Haven Sheltie Rescue, Inc., the dog rescue organization where we adopted Biscuit, that he suffered from living in a puppy mill, as his rear legs were slightly deformed. We made sure Biscuit took his daily arthritis supplements to help his condition. As a result, Biscuit could not walk too far of a distance at a time, although he did enjoy his daily walks around the neighborhood! I did not want Biscuit’s arthritis to stop him from going on longer walks, traveling, and sight-seeing. As such, I looked into finding something that we could use to push Biscuit around in! I came across the Hound About via Google searches. When I showed Doug the Hound About, Doug, at first, told me that it was “over the top,” but he indulged me in my quest. Since we ordered his Hound About from California (not local), Doug and I cut out newspapers to the appropriate dimensions to discern which size to get Biscuit. So, we settled on the larger size, the blue Hound About. Biscuit immediately fell in love with his Hound About! Doug and I have so many wonderful memories of Biscuit in his Hound About. Since our old house, unlike our new house, did not have a garage as it was located in the city, we kept Biscuit’s Hound About in our guest room! We are so thankful to now have a garage for the cars and storage! 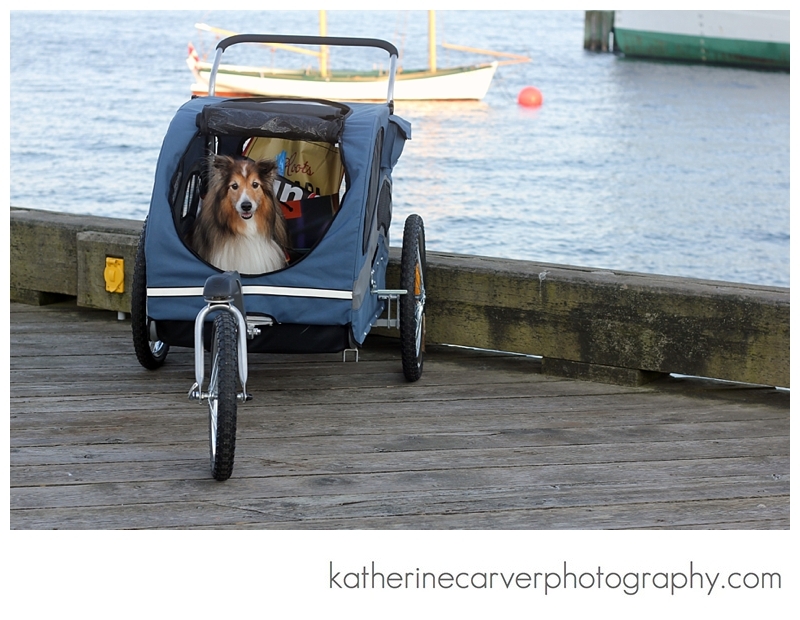 Some evenings, during the warmer months, we skipped the gym and took Biscuit for a ride around the Harbor, which he loved! Biscuit was very smart. Since the Hound About was too wide to fit through the front door, Doug had to take the three wheels off the carriage portion of the Hound About to enable us to get the Hound About in and out of the house! As soon as Biscuit saw us taking out his wheels to his Hound About, he got so excited! He barked and smiled, ear to ear, and ran out the front door, just waiting for Doug and I to quickly assemble his Hound About so he could get going on his ride! The Hound About went everywhere with us when we traveled, and we have many wonderful memories from our two trips to Nova Scotia with Biscuit! Biscuit proudly went all around Halifax in his Hound About and loved every minute! Biscuit loved all of his local Hound About rides as well! We have many memories of taking our beloved Biscuit to dinner in his Hound About as well as stores where furry friends were permitted! He was such a hit with the ladies strutting around in his Hound About! We are so glad that the Hound About brought Biscuit so much joy, and most of all, the Hound About allowed us to do so much more together! Now, the Hound About has been passed down to little Victory, who seems to love the Hound About as much as Biscuit did! We are sure that Biscuit is smiling down and is happy that another sheltie friend in need, his sissy, is enjoying it as much as he did! We are so thankful that Biscuit entered our lives and brought us so much joy. Biscuit is pictured below in his Hound About in downtown Halifax after he went shopping with us at Lululemon and Roots among other stores (Biscuit went inside the stores with us)! 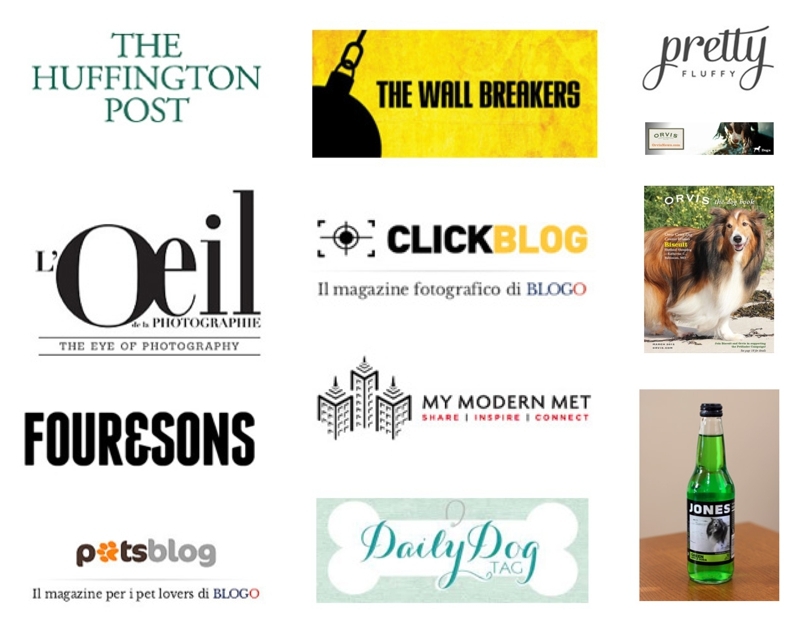 In the spirit of the recent Oscars, the Daily Dog Tag recently featured the ‘Dogscar’ nominees, which you can view here and here. 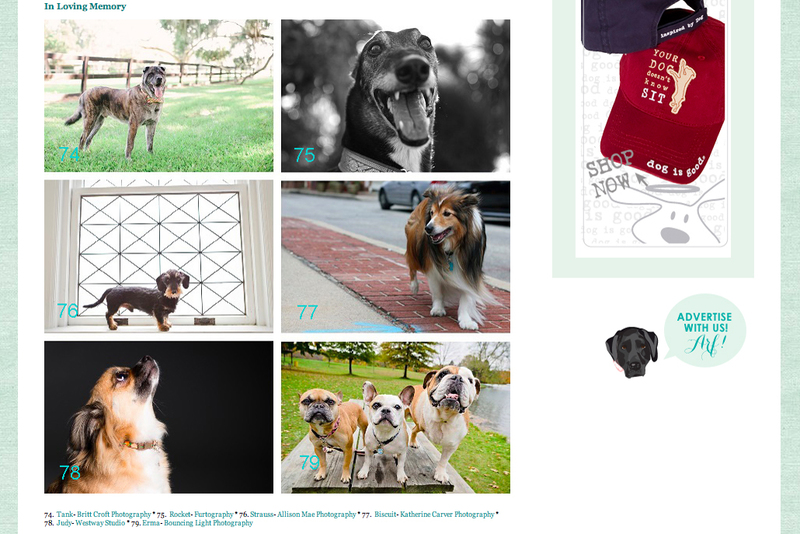 Biscuit was featured in the “In Loving Memory” category, #77, shown below. We sure miss our precious Biscuit and think of him everyday. We know that Biscuit is always with us in our hearts. Today marks seven months since our precious Biscuit passed away. One of the things that I miss most about our little Biscuit was his pure, genuine, and unconditional love. No matter what, Biscuit loved us unconditionally. This is priceless. It took several months after Biscuit arrived in our home to build trust and for him to feel comfortable. After he knew that he was out of harms way, he literally blossomed emotionally and physically. 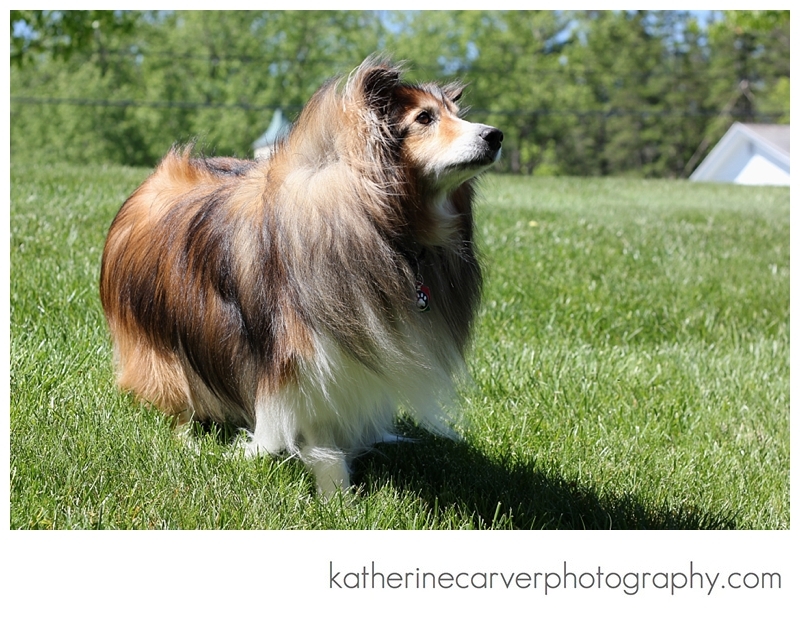 He gained his confidence and he blossomed into the most handsome sheltie dog ever! Biscuit loved us both very much; however, Biscuit and I had a really special bond. Due to our schedules, I ended up spending more time with Biscuit during the short time he was with us. This provided me many opportunities to photograph Biscuit, my muse. Biscuit followed me everywhere, including the bathroom! Therefore, I tried not to get up from my desk too many times, while I was working, so little Biscuit would not be disturbed as he always got up each time I got up! I do miss the days when he would sleep on his Orvis bed next to me while I worked at the computer for hours. He was a faithful and loyal companion. There were times, including times that we traveled to Nova Scotia, that Doug took Biscuit out for a walk and Biscuit would buck and refuse to move while looking back at the house until I came outside and went with them on the walk! Needless to say, it was frustrating for Doug, but I did not mind going on more walks together. I am sure that Biscuit knew that he ran our house. We tried everything to break Biscuit’s ‘bucking,’which would come and go, but it just did not seem worth the fight at the time. It just meant more time for the three of us to be together, and maybe that is what he wanted. Biscuit always loved being with us and we packed so many adventures and trips into the short amount of time that we had, although we did not know it at the time that our time together would be much too short – exactly 2.5 years together. Nobody has ever loved me the way Biscuit did and Biscuit is one of my greatest teachers. I do not think that we ever truly ‘get over’ the great losses in our lives, which Anne Lamott discusses in her new book Stitches, which I just finished reading. I do know that Biscuit will live on in everything that grows around us and within our hearts. 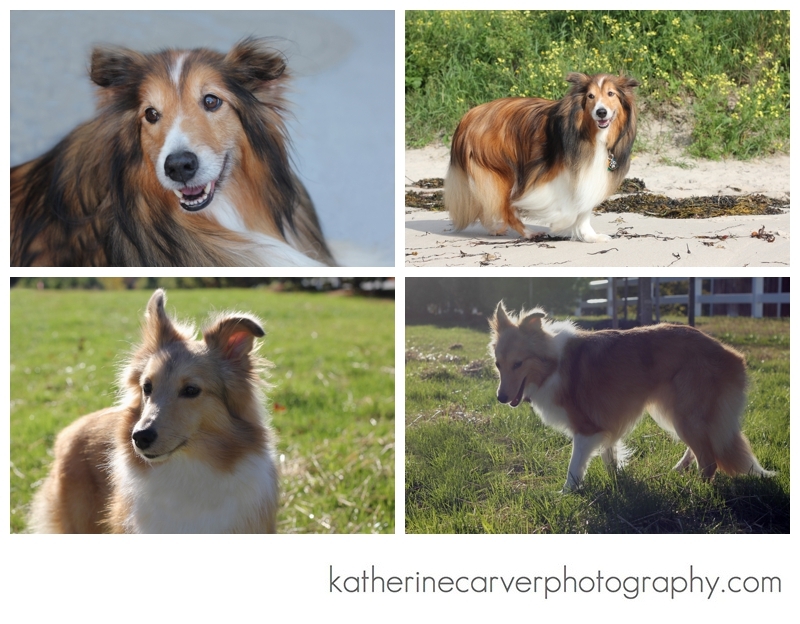 Below is a small photo collage of our fur babies, Biscuit and Victory! I am so grateful that I consistently photographed Biscuit and continue to photograph Victory,both my muse. It is really nice to flip through our photo albums and our digital images. We are so grateful for Biscuit and Victory — they make life so much sweeter! Today marks six months since our precious Biscuit passed away. Anyone who met Biscuit or saw photographs of Biscuit knew that Biscuit had a beautiful and fluffy fur coat, as shown below. Biscuit went through a magical transformation both physically and emotionally from the time when we first met Biscuit. Biscuit literally blossomed. Biscuit was a trooper and he let me give him a bath with no issue. Most of the time, Biscuit was pretty cooperative with me brushing out his fur coat to keep him looking his best in exchange for some prescription kibble! Biscuit did not particularly like going to the groomer, but he tolerated it in order to get his nails and paws trimmed. Most of all, Biscuit’s beautiful fur coat is evidence that humans can have a huge positive impact in dogs’ lives. We hope that Biscuit’s rescue story helps influence others to consider dog rescue. There are so many dogs in need of furever homes. When it comes to Biscuit, I am not sure who rescued who. Biscuit was a gift. Doug and I still think of Biscuit daily and we are very grateful for our time together. We know that Biscuit sent us a gift — our little Victory! Tomorrow marks five months since our precious Biscuit passed away. 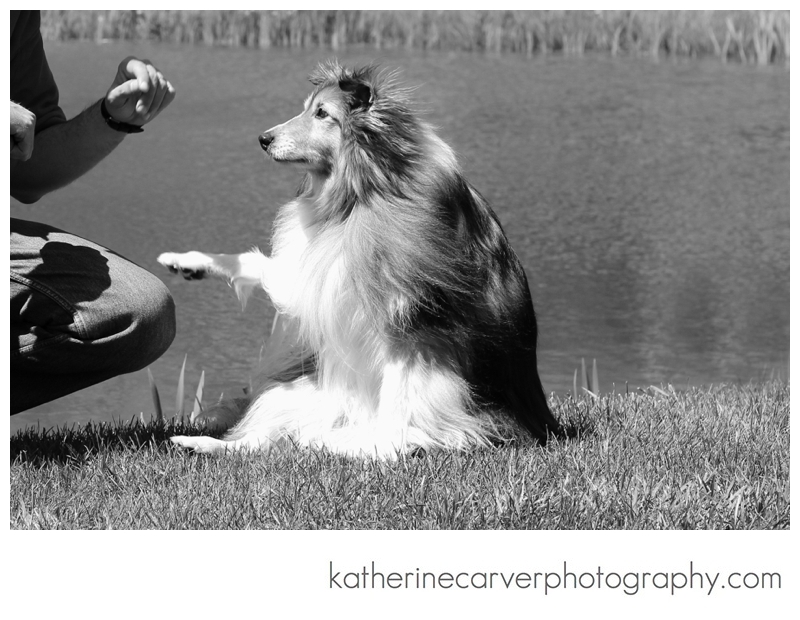 Anyone who met Biscuit in person knew that he loved to give paw! When we first rescued Biscuit, he was very shy and timid. Initially Biscuit often did not leave his bed for days. Until one night as Biscuit sat on his bed in front of our fireplace, Biscuit gave us his paw — this was the first interaction he initiated with us. Maybe Biscuit was telling us that it would all be ok. Doug and I were so happy that Biscuit was coming out of his shell that we began to “treat” Biscuit each time he gave us paw! Biscuit quickly learned that his little paw could get him just about anything! Each night during dinner, Biscuit would situate himself and paw at Doug and myself for food! On the weekends, before we learned about his kidney issues, I made him yogurt parfaits! Biscuit loved them! Each night after the gym, Doug and I would play with Biscuit and he would give us his paw in exchange for treats, which later became “prescription kibble treats.” Biscuit never hesitated to give friends and family his infamous paw as well! I think he knew it was his “magic touch!” Biscuit was always very persistent and when he made his mind up, he never gave up! The photograph below captures a moment in time when Biscuit gave his Daddy the paw in exchange for some prescription kibble. I miss Biscuit and I miss him giving us his infamous paw — his trademark! No matter what, I know Biscuit will always be with us watching over us and our newest edition to our family, Victory — another gift and blessing. I am truly grateful for our time with little Biscuit. Biscuit was a gift and he changed our lives for the better. I hope that others will consider dog rescue; and I hope that others have experienced and will experience this precious relationship with our furry family members. Today marks four months since our precious Biscuit passed away. Each day, Doug and I think about our beloved Biscuit. Biscuit added so much to our lives, which is difficult to accurately capture in words. Doug and I both will always remember Biscuit’s wonderful smile. As Doug stated in Biscuit’s eulogy, Biscuit’s trademark smile always began as a serious forward-looking stare; and then with perfect timing Biscuit turned his head to one side and opened his mouth, culminating in a full ear-to-ear smile. Biscuit’s smile transformed each day. We are very grateful for Biscuit entering our lives and for Biscuit giving us so much unconditional love. Doug and I have been blessed again and we are extremely happy that Biscuit sent us our beautiful Victory. Without Biscuit entering our lives, we would never have met little Victory. Victory is gorgeous and we are also extremely grateful that Victory has entered our lives and that she has become a beloved member of our family. Doug and I love sharing our pillows with Victory and enjoy her evening sniffs and kisses — she loves sniffing and licking eye lashes and ears! Each day Victory is becoming more confident and comfortable in her new home. Biscuit has given us a wonderful gift — the ability to grow and love another dog deeply and unconditionally. We know that Biscuit is smiling down on us as he sent us another sheltie friend like himself who needed a second chance like him. 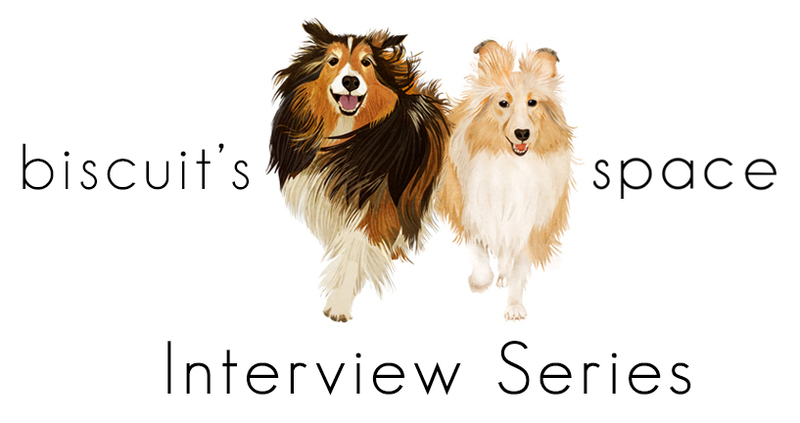 There is no doubt that Biscuit sent us the ‘right’ sheltie, Victory! 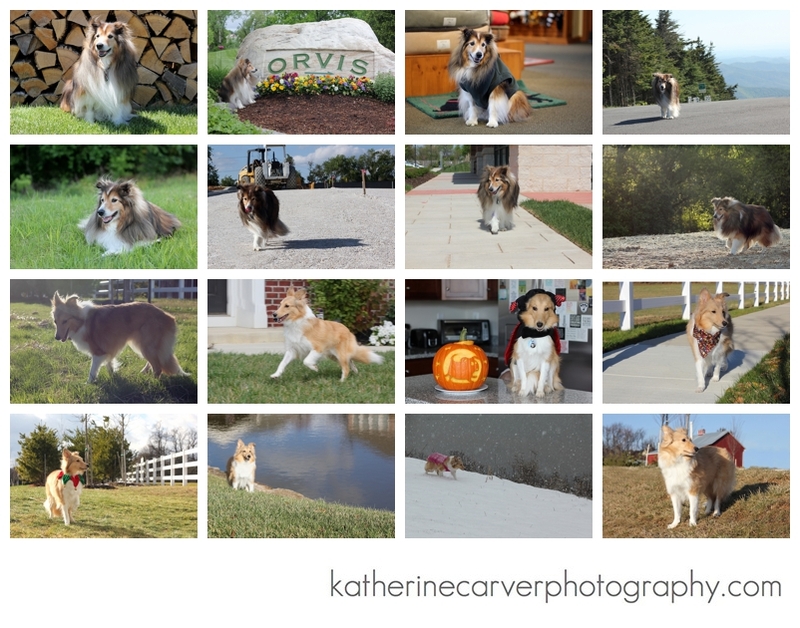 Biscuit is forever in our hearts and his images adorn our home along with Victory’s images. From our wonderful experience, we highly encourage others to consider adopting a rescue or shelter dog who needs a loving furever home — I guarantee your life will be forever changed for the better. Biscuit (top) and Victory (bottom) are pictured immediately below — our fur babies.